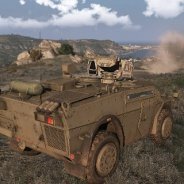 The game is a sequel to the series of popular military simulartions that began with Operation Flashpoint and has recently gained a new source of fame with the success of Arma II mod Day Z. Government authorities accused the unnamed pair, aged 28 and 33 accoring to a Greek News247 report, of scouting the area and taking pictures and video of military facilites on Lemnos. The developers argue that the pictures were necessary to enhance the graphics of Arma III. "We can confirm that two Bohemia Interactive employees, our colleagues and friends, were arrested during their holiday trip to Lemnos," reads a statement on the BI forums. "They visited the island with the sole purpose of experiencing the island's beautiful surroundings." This is not the first time local authorities have taken action over the actions of the Czech studio. Last year Lemnos officials issued a statement decrying the use of the Island in a military themed shooter. "We cannot fathom that our island, a place of peace and creation, will be turned into a scene for violence and battle," said Lemnos Mayor Antonis Hatzidiamantis as reported by the AFP. "We reserve our legal rights to defend our island's reputation," he said. He was joined by the local municipal council head Costas Adamidis, who framed the issue as a question of national security. "There are national reasons to keep certain areas on the island secure but they are shown in high-definition," said Adamidis. "There could possibly be problems with national security." Another official pointed to the proximity of Turkey as the reason the island is so sensitive about military secrecy. I wonder if the vacationers were aware, or were notified, that photographing the military base was illegal? Probably not! What they just want new idea for these games and beside it just a game we dont know what the REALLY have u know what i mean? Im in the same view mad_guns. That's pretty epic. Although you can see where the Greek Govt is coming from. What's stopping an attack on their bases if people stop by to take pictures "For research of games". Guess google earth isn't good enough for some people. Wonder what would happen if they wanted to see area 51 in detail?? This is all an marketing stunt, to get more attention. Nuff said.